Directions: When you apply for a Utah driver’s license or instruction permit as required, you will be required to answer questions about traffic laws. The knowledge test consists of 25 multiple choice questions that are important to the safe operation of a motor vehicle and Utah laws and driving practices. The questions are based on the information provided in the manual. You must score an 80% to pass the knowledge test. You are allowed to take two written tests in one day. You are entering a crowded freeway. What should you do to merge into traffic? Use the acceleration lane to adjust your speed to match the speed of freeway traffic. Use the entrance ramp to accelerate to the speed of freeway traffic and yield to traffic already using the freeway. Before entering traffic, use your mirrors and check your blind spots to verify that you have room to safely merge. Pull next to the driver and yell at them. Flash your high beams at the driver. Get back at the other driver by cutting them off. To avoid the dangers of road rage, you should never take it personally if another driver cuts you off in traffic. Just let it go and continue driving safely. 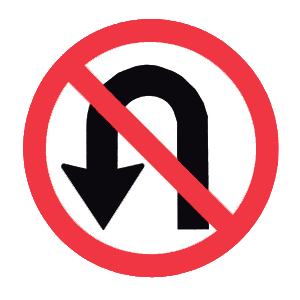 This sign prohibits U-turns. Do not make a U-turn where this sign is posted. Crossbuck signs tell drivers to yield to trains at a railroad crossing. Drivers should not try to outdrive a train. Lane reduction; the right lane ends soon. 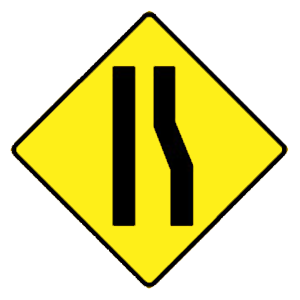 Lane reduction; the left lane ends soon. 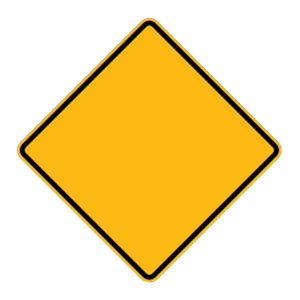 This sign indicate that the right lane ends ahead.